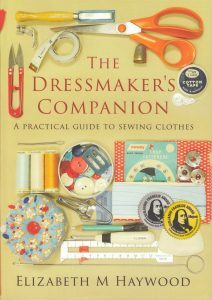 This month The Dressmaker’s Companion turns one. While I’m no veteran of book talks, I’ve done a few since then, always with an opportunity for questions at the end. Sometimes no-one asks any and sometimes people ask questions during the talk (especially if the group is small). Read more about my publishing story here. Why is there a growing popularity for learning to sew? I think there are several reasons. Sewing has shared in the resurgence of craft that has made knitting, crochet, spinning and weaving popular again. These are being discovered by people who didn’t do sewing or home ec as school or whose mothers didn’t sew. I think many people who have a job in front of a computer or office desk job want a creative outlet. Sewing has been given a boost by TV shows such as The Great British Sewing Bee and Project Runway. Dressmaking in particular appeals in reaction to fast fashion – cheap clothes coming into shops every day, dispensable clothes essentially. By making your own clothes you can make something unique and different and know that you’re wearing something no-one else has. Interestingly, in the past women sewed their own clothes to be affordably fashionable but now many women sew to op-out of fashion. Do I own a lot of fabric? I never used to, but since we moved to the country my collection has increased about seven-fold. I like to have fabric on hand since I can’t just nick down to Spotlight to buy some, but I rarely seem to buy fabric at all – I buy fabric from the op shop if I see it, but much of my fabric has been given to me by friends clearing out relative’s estates. So the answer is yes, yes I do. Did I choose metric or imperial measurements for the book and how did I decide? A good question! I picked metric with imperial in brackets, unless it was for an example in which case it was simpler to only have metric. When writing a book, consistency is important not just in measurements but also in style, spelling and layout. Since The Dressmaker’s Companion is an Australian book by an Aussie and published in Australia, I chose metric measurements and Australian English. What fonts did I use? The front cover is in Trajan Pro, which is apparently (over) used on movie posters. It only comes in capitals. I agonized over the interior’s fonts: the title pages are Deja Vu Serif and the chapter headings are in an italicized version (which looked friendlier that non-italicized). The text is Calibri and the headings are bold Gadugi. The chapter contents are regular (not bold) Gadugi, as are the page headings. The page numbers are bold Deja Vu Sans. Am I going to do another book? I never thought I would, but I’ve just started one! This time I hope it will take less than a decade! It’s a patternmaking/sewing book with projects. What did I do about the Internet? (This question was asked at country town near me, I’m guessing with the same Internet reliability as us). We’re on dial up Internet; the NBN (National Broadband Network) passed us by, no Wifi and no mobile coverage. Uploading the large files to the printers could only be done in the morning when the Internet was working well. By lunchtime it was too late and by evening, well, forget it. Avoid rainy days when the Internet and phone line drop out! How did the book award people discover my book? For book awards, the author or publisher actually enters. There’s an entry fee and you send multiple copies of the book for judging. Interesting questions can certainly enliven a book talk and bring audience and writer together. Now when I attend other people’s book talks I try and think of intelligent questions to ask! 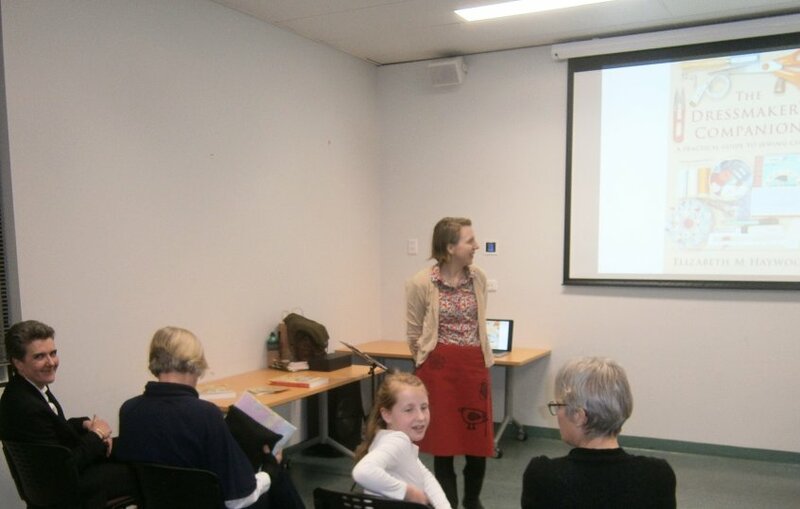 Many thanks to Greenacres Library for hosting a Dressmaker’s Companion book talk last week, where no-one asked any questions but we all had a great time. I guess you are good at giving a book talk by now, since you’ve done so many of them. It was interesting to know what kind of questions people ask. I’m very much looking forward to seeing your next book, especially pattern making part and the PROJECTS! Good luck and happy sewing with your coming projects!